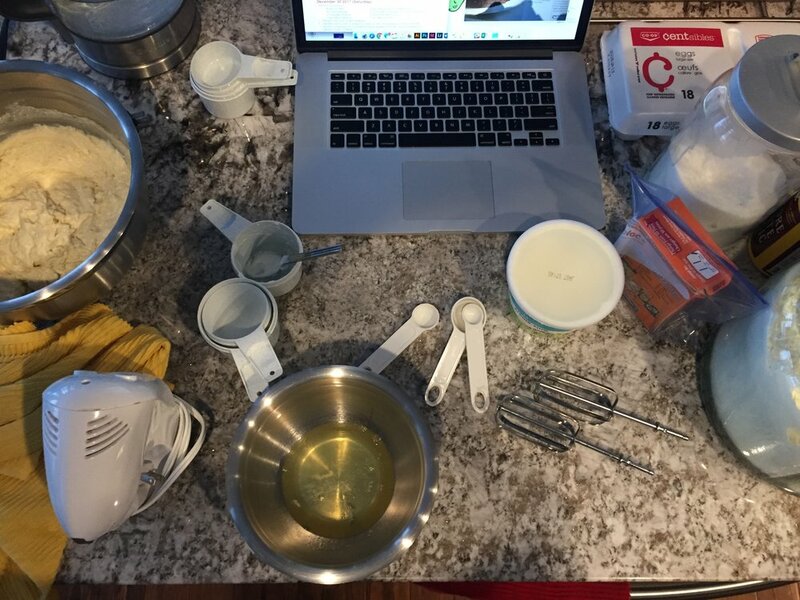 Since starting this 365 day challenge of baking and cooking, I thought I would stop after a couple days, but honestly I am excited to see what I can do. Sometimes after a week I just loose interest, but not this time. For the past 2 weeks I have been constantly searching for more than 365 recipes to make over the next year. It was very meticulous and seemed like it was never going to end. When I found my final recipe I was so excited. I plan on blogging on a weekly basis, so I will talk about the recipes I tackled that week as well as sharing my recipes and letting you know what I would change. I decided to start on Christmas eve with making a Vegan Punkin Pie for my brother’s girlfriend. I am also pushing myself out of my comfort zone with making some of the recipes over the year. This recipe was a lot easier that I though it would be. It was literally all made in the food processor. For Christmas I decided to tackle another Vegan option, so I made a Roasted Cauliflower which was suppose to represent a Vegan Turkey. It didn't take long to prep, but it took over an hour to cook. It turned out absolutely amazing, they said it tasted like a turkey. So it was a complete success. In a bowl blend all seasoning ingredients together to form a paste. Evenly spread paste all over your cauliflower head. Boxing Day was a very long day since we went out shopping and walked around. We had to go and visit a new coffee shop so when I got home I decided to challenge some muffins. I always make cupcakes so this was only my second time making muffins. It was amazing that I got to use Cointreau in this recipe, but I would change the recipe a little to make it 1/2 cup milk and 1/2 cup orange juice, and add a tablespoon of orange zest. The muffins still ended up tasting amazing. Preheat oven to 350 degrees F (175 degrees C). Butter a 12-cup standard muffin tin. Place the cranberries in an ovenproof bowl and stir in the Cointreau. Cover tightly with aluminum foil and place in the oven until cranberries puff up and absorb the liquid, 5-10 minutes. In a bowl, sift together the flour, baking powder, salt, and sugar. In another bowl, whisk together the egg, milk, and melted butter until well blended. Using a wooden spoon, quickly fold the flour mixture into the egg mixture, then stir in the cranberries and the soaking liquid; do not overmix. Spoon the batter into the prepared cups, filling them 2/3 full. Bake until the muffins are well-risen and browned and a toothpick inserted into the centre of the muffin comes out clean, 20-25 minutes. Let cool in the pan on a wire rack for about 3 minutes, then remove. Serve warm or at room temperature. I have wanted to try and make French Onion Soup for a very long time but never had the time to try and make it. It turned out amazing but I would make a couple changes. I would add way more cheese to the top of the bowls, less sherry, and use all beef broth instead of adding chicken broth. I used a ton of onions, but I think it made it so much better. There should have been way more cheese to melt over the edges but I only used what I had shredded. I might also do a mix of cheeses, using some gruyere and add some moose as well. In a large, wide saucepan over medium heat, melt the butter. Add the onions and sauté, stirring occasionally, until they are evenly golden, 20-30 minutes. Sprinkle the flour over the onions, stir and cook until evenly distributed, 1-2 minutes. Raise the heat to medium-high and gradually add the stock, stirring constantly. Continue to stir until the mixture comes to a boil and is smooth and thickened 3-4 minutes. Add the molasses and stir until blended. Gather the parsley, thyme, and bay leaf together into a bunch, fold over the stems, and tie securely with kitchen string. Add to the pan. Reduce the heat to low, cover partially, and simmer gently until the onions are very tender, 30-40 minutes. Season to taste with salt, pepper, and cayenne. At serving time, preheat the broiler (grill). Warm 4 deep, flameproof soup bowls. Remove the herbs from the soup and discard. Stir in the sherry to taste. Place the soup bowls on a heavy-duty baking sheet and ladle the soup into the bowls. Float 2-3 baguette slices on top of each bowl. Sprinkle the cheese on the bread slices. Place under the broiler with cheese topping 4 inches from the heat, and broil until the cheese melts and starts to turn golden, 4-5 minutes. Serve immediately. On December 27 I decided to get up and make my family waffles, but not just regular waffles, they were Sour Cream Waffles. The recipe is fairly simple but when mixing the batter, it turned out to be more of a dough. (I think I over mixed it a little). I also added a little vanilla to the recipe because I know that all waffle recipes have vanilla in them and I found it weird that this recipe didn’t have any. If I would have made it for all the family I would have had to double the recipe because only this recipe only made seven waffles. My parents rated it 8.56 out of 10. I would say that this is a success. Before you start, preheat a Belgian waffle maker. In a bowl, beat the egg yolks until smooth. Add the milk, butter, and sour cream and whisk until smooth. In another bowl, sift together the flour, baking powder, baking soda, and sugar. Add the flour mixture to the egg yolk mixture and beat well. In a clean, dry bowl, using an electric mixture, beat the egg whites until stiff peaks form. Carefully fold the egg whites into the batter. When the waffle maker is hot, pour enough batter for 1 batch to evenly cover the grid. Close and cook until is opens easily. The waffle should be golden brown. On December 29 I decided to challenge myself and attempt to make macarons. I kew that it was going to be difficult, but I thought why not try and make them. I used a recipe for Vanilla Macarons with Vanilla Buttercream, I thought it would be too much vanilla but it had very good flavour, it was awesome. The macarons deflated but didn't re-inflat which was kinda sad. My brother tried one and he said it was unreal. I think next time I would watch them a little bit more carefully. They still tasted really good. In a medium bowl, beat the egg whites until frothy. Keep beating and slowly add sugar until stiff peaks form. Sift powdered sugar and almond flour over the egg whites. Fold the dry mixture into the egg whites, giving the bowl a quarter turn every third fold. Make sure to not overmix or the macarons will not rise. Once the batter reaches a lava-like consistency, transfer half the batter to another bowl and add the food coloring. Mix until just combined. Do not overmix! Working quickly, put the white and pink batters into separate sandwich bags. Cut the corner off of each bag and squeeze the two batters evenly into a larger gallon-size bag or piping bag to create the multicolor effect. Pipe 1½-inch dollops onto a baking sheet lined with parchment paper (Tip: take a little batter to “glue:” down the edges of the parchment paper so it stays put). Let the cookies rest for 30 minutes to an hour, until they are no longer wet to the touch and a skin forms on top. Let rest for 10 minutes before filling. To fill, pipe a circle of the cream cheese mixture around the edge of one cookie and place a small dollop of jam in the center. Sandwich with another macaron. Cut butter into pieces, and mash with a spatula until the consistency resembles mayonnaise. In a small bowl, whisk the egg yolks, then add the granulated sugar, and whisk until the mixture lightens to an off-white and you can no longer see the granules of sugar. Add the milk, and whisk to combine. Pour the egg mixture into a small saucepan, and heat over low heat, whisking frequently to ensure that the mixture does not curdle or scorch. Cook until the mixture becomes thick and custardy, like pudding. Pour the egg mixture back into its bowl, and whisk constantly until it returns to room temperature. Whisk in the butter in three batches, add the vanilla, and stir until smooth and all ingredients are fully combined. Pipe or spread onto one macaron half and sandwich between the other. For New Year’s Eve I decided to make a dip that my brother and his girlfriend would really like. I decided to make Hummus. The recipe was absolutely easy, minus the fact that you have to cook the chickpeas and then peel all the skins off. It took forever! Other than that everything goes into the food processor and then pulse. It starts off really thick, so you have to add a little lemon juice or the chickpea water to thin it out. I had them try it and they both said it tasted amazing, so amazing that they took some with them to Banff on New Year’s Day. Drain the chickpeas and put them in a saucepan with water covered by 2 inches. Bring to a boil, reduce heat, simmer, uncovered, until the skins crack and chickpeas are tender, about 1 hour. Remove from heat, drain, reserve the liquid. In a food processor, combine the chickpeas, 1/2 cup lemon juice, tahini, 3 tbsp oil, garlic, cumin, and 3/4 tsp salt. Process until soft. Taste and adjust with salt and lemon juice. Transfer to serving bowl, drizzle 1 tbsp oil over. Sprinkle parsley and paprika and serve. Stay tuned for next weeks blog about the week’s recipes. Hopefully everything continues to be a success.